With regards to the ingredients of the recipe: As in most of my recipes that call for ‘soy’ or ‘non-dairy’ milk, you can easily replace it with your favourite non-dairy milk, such as coconut, rice, oat, hemp & co. Just bear in mind that these can add additional flavouring to your buns – depending on the type and brand. We use soy milk on an everyday basis – simply as we use a lot of it (Nick loves his cereal bowls, and I love a creamy porridge!) and it’s the cheapest one we can find in the UK. Maybe I should invest in a soy milk maker? A couple of days ago my colleague actually brought a couple of free from Hot Cross Buns to the office – they were vegan, but sadly used palm oil, which I am trying to avoid and therefore also did not have any buns that day. The more a reason to be making my own this week – and let’s be honest: self-made nearly always tastes better than store- bought. 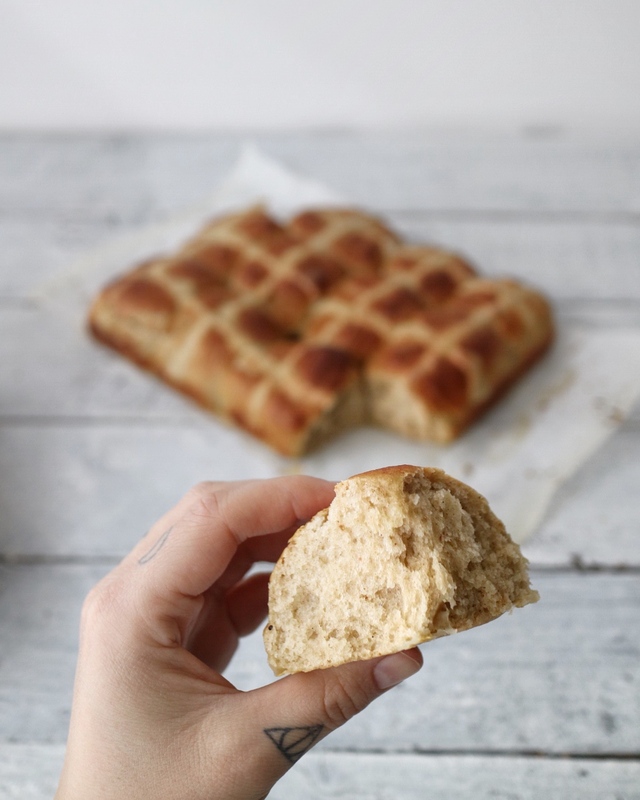 And yes, I am saying ‘almost’ on purpose here – I am sure everyone has a failed recipe every now and then 😉 For me it was that time I tried to create bread completely without flour… but let’s talk about that another time! 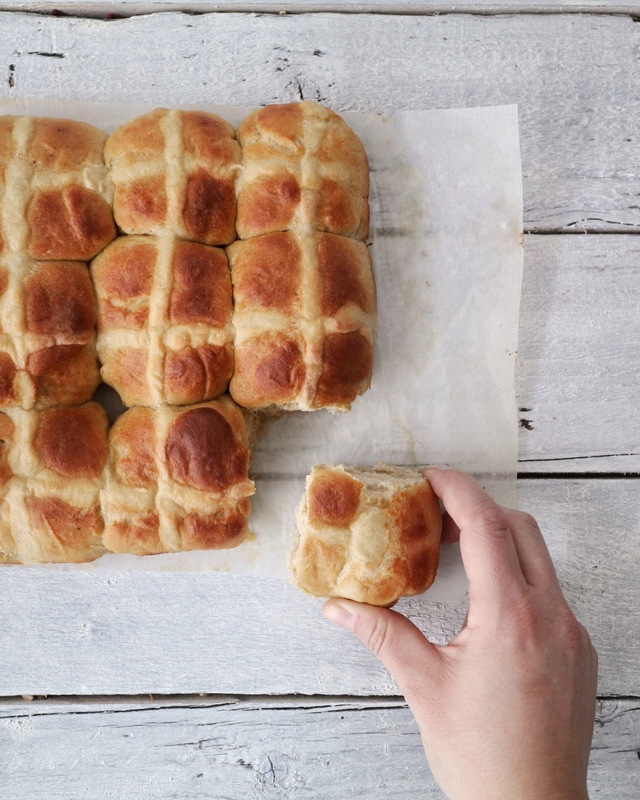 Did you know: Where does the Hot Cross Buns Tradition come from? 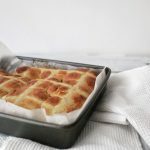 The origins of hot cross buns may go back as far as the 12th century. 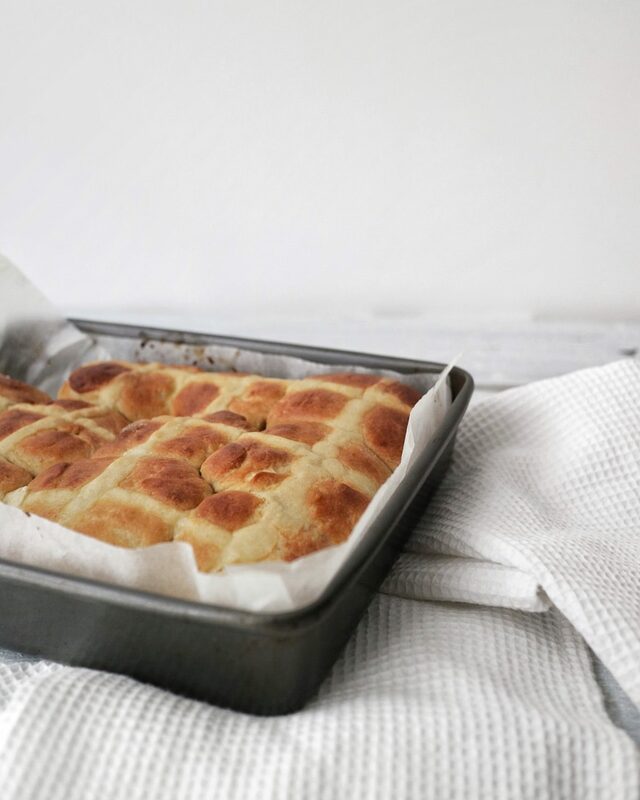 According to the story, an Anglican monk baked the buns and marked them with a cross in honour of Good Friday. Over time they gained popularity, and eventually became a symbol of the Easter weekend. Juice of 1 mandarin – keep one tbsp aside for later! 1. In a large bowl add the yeast, 1 tsp of brown sugar and the lukewarm water. Let it stand for a few minutes until the yeast has foamed up. 2. Add the soy milk (make sure it’s room temperature! ), rapeseed oil, salt, cinnamon, nutmeg, sugar, lemon zest and mandarin juice – make sure to keep 1 Tbsp mandarin juice aside as you will need it later on!. Also add 1 cup of the flour and use a spoon to combine everything. 3. Once combined add 2 more cups of flour to the mixture and keep combining the ingredients. It’s helpful here to switch over to using a large spatula or a pastry whisk if you have one. Keep adding the rest of the flour until the dough is not overly sticky anymore. 4. Form the dough into a ball, lightly oil the bottom of your bowl and place the dough inside. Cover with a clean, wet kitchen towel and set aside to rest for an hour. 6. Once the hour has elapsed, punch the dough down and knead for about a minute to get rid of any air that might be captured inside of it. 7. Separate the dough into 12 equal pieces and roll each piece into a ball. 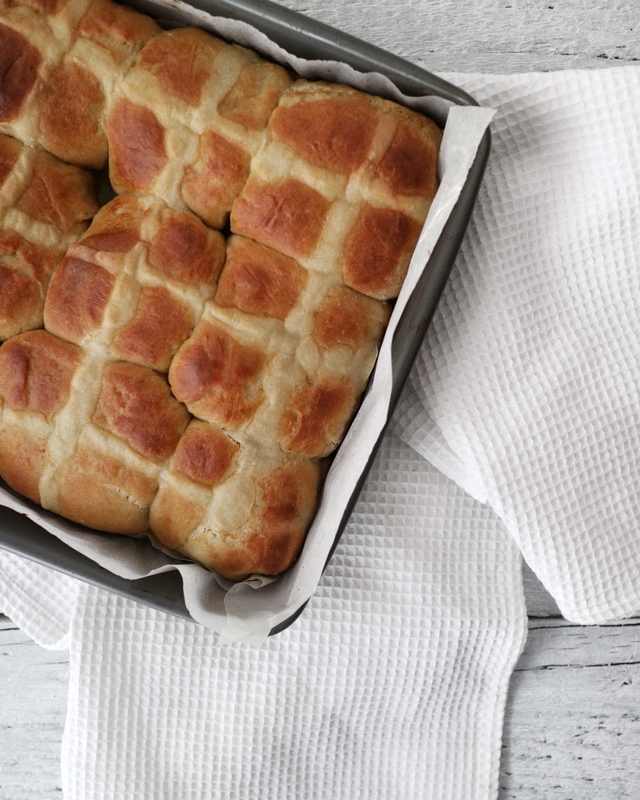 Place them in your lined oven dish – it’s fine if they are close together (as mentioned above, they’re supposed to stick together) – and cover with a wet towel once again. 8. Let them rest for another 30 minutes and preheat your oven to 190 degrees C in the mean time. 9. Blend all ingredients for the vegan egg wash and gently brush it across your buns. Combine all ingredients for the crossed with a fork, then transfer the mix into a small piping back (or simply cut down a big one). Once the mix is inside, cut of a tiny piece of the tip and pipe the lines across the buns to create the crosses. 10. Place the buns in the oven and bake them for 20-35 minutes until golden.